Free games: Win a key to play medieval warlord MMO Conqueror’s Blade this weekend! How would you like to become a medieval warlord? Big ask, we know, but take it into consideration. It’s what you’ll become if you start playing Conqueror’s Blade – which isn’t out yet, but is being tested in a number of play sessions that you can partake in. How? That’s easy. All you need to do is enter our giveaway for 20 codes that will get each winner into all the future test sessions for Conqueror’s Blade. There’s actually one being held this weekend – from November 2 until November 4. It’s a great way to experience the tactical battles of the upcoming free-to-play MMO but will also introduce you to what the game is all about. 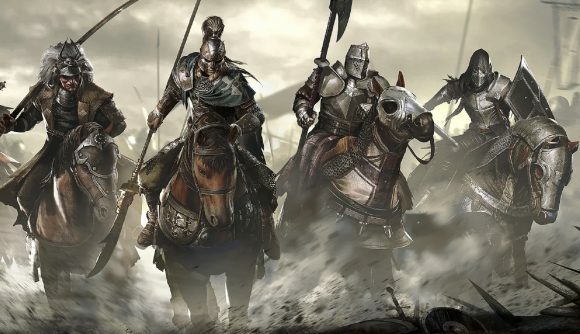 If you’re into games like Mount & Blade, Crusader Kfings, and Chivalry: Medieval Warfare then Conqueror’s Blade should scratch the itch that sits just out of reach under your shiny armour. It does that by combining brutal class-based action, dynamic squad tactics, and campaign-level strategy. What’s most distinctive about it is that in its distinctive historical setting the medieval West meets the East. That means you get to select units from a range of medieval superpowers, including: Swiss Halberdiers, Iron Buddhas, Mongol mounted archers, and Samurai. The battles are played out on a huge scale – there can be up to 1000 units charging at each other on your screen – and let you siege massive fortresses how you wish. Want to destroy the walls with a trebuchet? Carry on. Prefer to send waves of men to climb up ladders and probably die in the process. Go ahead you monster. You’ll also have to manage a kingdom outside of battles, looking to be civil as you engage in economic and diplomatic choices that affect the fates of your people. You can expand your territory and build castles to defend it. But could equally be beaten back into submission in this large and persistent online world. As said, if you want to win a key so you can play Conqueror’s Blade this weekend during the test session – as well as in future ones – then you’ll need to enter our giveaway. You can do that via the widget below. Every action you complete is worth one entry into the giveaway, with the more actions you complete increasing your chances of winning.